A few years ago I was offered an overlocker with a horn cabinet but it took a great deal of courage to plug it in and use it. An overlocker looks completely different to a sewing machine, all those knobs, dials, spools and strange names like upper looper and lower looper – it was quite an intimidating machine. When I did venture enough courage to give it a go, the sound was tremendous and it went at such a pace – I found it ran away with me. No wonder it was cheap, as soon as I began to rely on the nicely finished edge, the overlocker would break requiring patient re-threading – only to have it break again. In sheer frustration I decided to buy a second hand baby lock evolve which had ‘blown air’ threading and have never looked back since. Threading requires no more than putting it down a little hole and watching it whizz out the right side when the button is pressed. It is the threading that makes the cost of an overlocker more expensive, but it depends on how often you change the spools. An overlocking machine gives such a professional finish to all home sewn projects, the beautifully neat edges make the home made outfit difficult to distinguish from shop bought – except of course beautifully fitted! 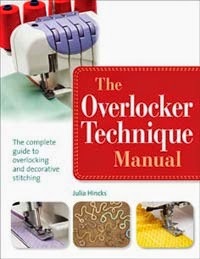 I had not really got much more beyond that with my overlocker until I saw this manual from Julia Hincks. It shows just how versatile these machines are, you can make tee shirts using the overlocker alone, as it handles stretch fabrics with ease. This book opens up all the possibilities of the overlocker, making it more than just a companion to the sewing machine. The book explains how to make the most of the machine not just techniques but also additional feet and other tools. I did not realise that you can get beading feet for overlockers as well as bias binding feet. It also explains how to get the lettuce edge finish that looks fabulous on sheers and lightweight fabrics. Another useful section in this book is the fault finding and adjustment section – she highlights some of the common problems with thread tension and more importantly how to correct it, to create a balanced stitch. This is definitely one for the sewing room bookshelf, an excellent guide book and one that unlocks the many potential uses of these wonderful machines.